A well designed kitchen fits effortlessly into its surroundings, reflecting the character of its owners and the house perfectly. 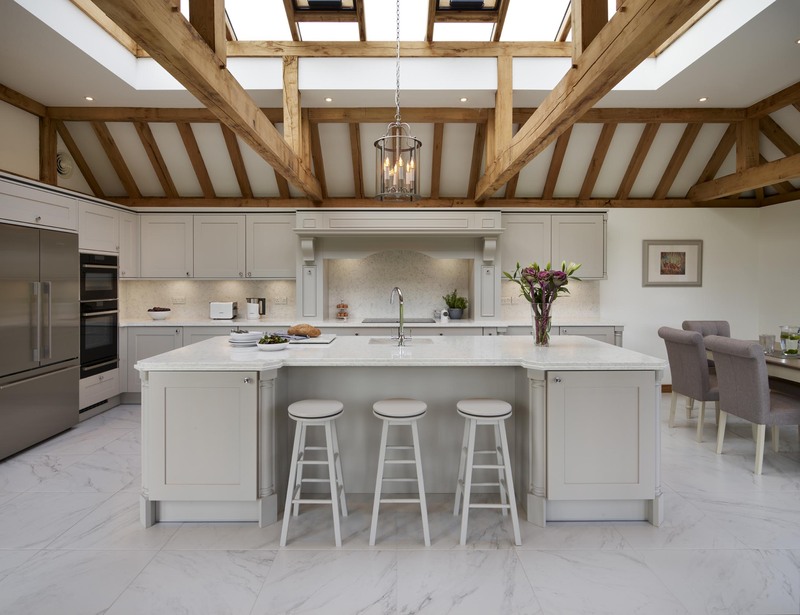 The latest project from the team here at Cambridge Kitchens and Bathrooms is one that we’re very proud of, designing and installing a kitchen into a stunning country listed building with a modern extension. The brief was simple: to design ’a modern classic simple styled kitchen, with subtle features to work with oak beams and vast amounts glass’. 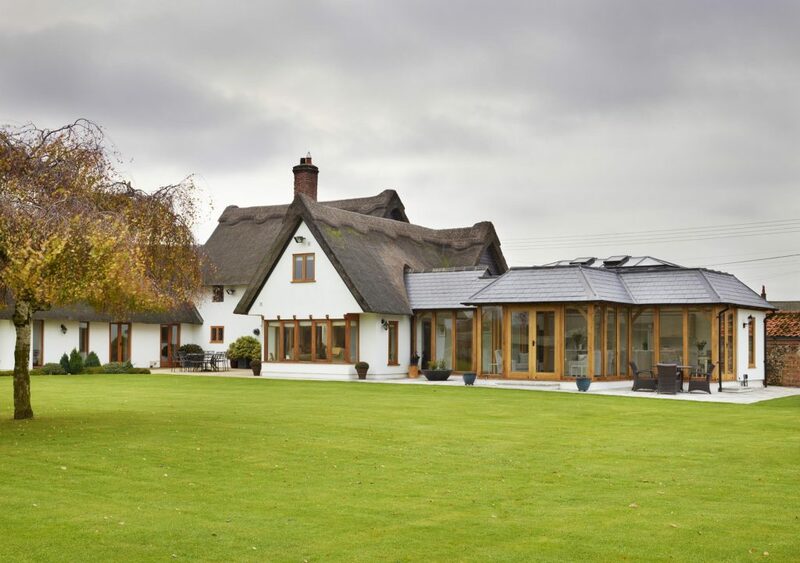 Primarily, it was important that the design did not overshadow the oak beams, these needed to be extenuated, and it had to fit in with the wider stylings of the property. The decision on materials was not an easy one to make; 3D designs can only go so far, it was the designer’s experience that really counted to make sure the design would work well in its environment. After much deliberation, it was decided that a Callerton Balham flat painted Gransden Grey shaker style door with classic features should be used for the units, this added to the simplicity of the design and gives a perfectly smooth finish. 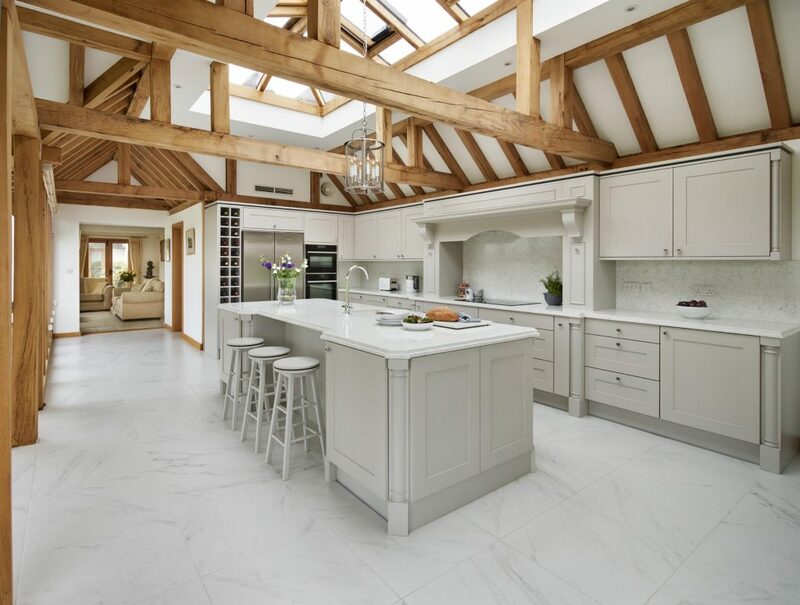 These units are then complemented by a Silestone worktop featuring an ornate built up edge detail, it also featured a subtle marble pattern which gave the kitchen a little more depth to compliment with the heavy Oak beams. 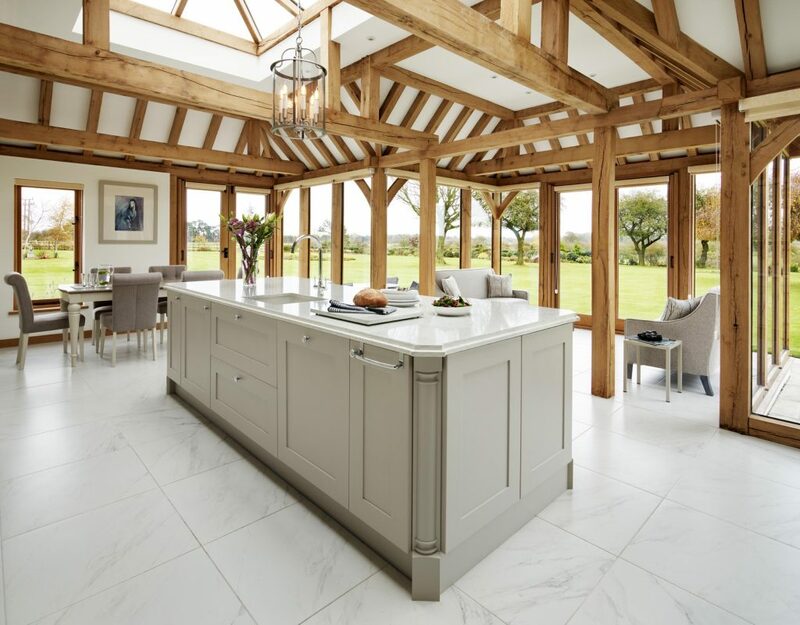 This was all finished off with porcelain floor tiles, which are subtle do not draw the eye away from the oak beams and the rest of the kitchen. The client enjoys their cooking and the appliances were chosen to suite their cooking needs perfectly. NEFF, known for its incredible cooking capabilities, was chosen as the main manufacturer for the appliances. This beautiful kitchen features a NEFF 80cm Induction hob with touch controls, a Pyroclean slide and hide oven, a combi oven with microwave, and an integrated dishwasher. Plus, a stunning large stainless steel American fridge from Fisher & Paykel. This kitchen not only looks great, but also features all the practical appliances you would expect form a modern kitchen. As always with large projects such as these, there were a few challenges. 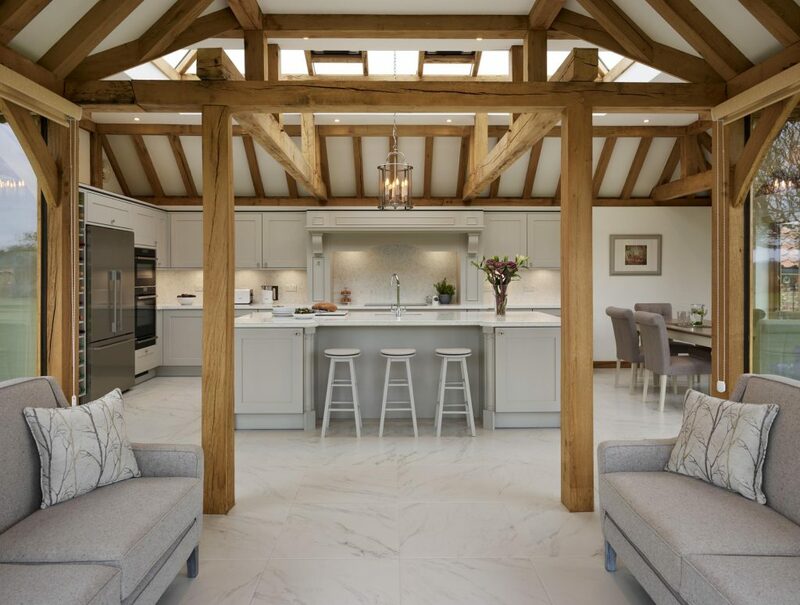 The designer started the design at the centre point between the beams, so that anyone looking in from outside would see the kitchen island and hob beyond perfectly line up in the middle of the beams. The other design challenge was the end run where the cooker and fridge sit, finding a way to integrate the appliances in a practical and visually pleasing way. There were several design iterations until the perfect design was struck. The beautiful kitchen and dining room is housed in a brand new extension, featuring oak beams and a vaulted ceiling. The property is a listed building which started out as a pub. The thatched roof and large central fireplace in the original part of the building gives a very warm cosy English countryside feel, with late 19th century furniture. The extension’s oak beams and glass really compliments the old building without jeopardising the its charm and beauty. It was essential for the kitchen to blend into the building to make the oak beams and the luscious gardens to take centre point. The designer added classic subtle details like the pilasters, double edging on the worktop, and splash backs to enhance the simplicity of the kitchen design. The project also included the design and installation of a purpose built boot room, which is situated adjacent to the kitchen. The client wanted an area where they could come into after a long muddy walk in the countryside to take off their muddy wellies and jackets. The inspiration behind the layout actually came from a Primary School coat peg section, giving a spate area for gloves, hats, scarfs and bags. Needless to say, the client loved the idea. The challenge was to design a traditional kitchen with a luxurious and homely feel, whilst ensuring it remained understated in a room with stunning glass and oak features. We feel the result achieves that. The kitchen really gives you that wow feeling and fits beautifully with the new extension, an impressive yet simple design which allows the buildings features to really stand out. The designer for the project, Bianca Shevlin, said “This was incredible project to work on, stunning house with interesting design challenges, but I feel the kitchen is exactly how I imagined it to work with the building”. It was a privilege to work on this project and a great opportunity to showcase the skills of the designers and installers at Cambridge Kitchens and Bathrooms.